With installed capacity of 9 MW, no other sporting facility in the world has larger solar farm than Indianapolis Motor Speedway (IMS). Brazil's World Cup stadiums such as Mane Garrincha and Estádio Governador Magalhães Pinto have PV arrays installed on their rooftops but theirs are smaller in size - up to 2.5 MW. In Europe, Verona’s Bentegodi football stadium is fitted with 1 MW of solar PV module. “In 1909, the Indianapolis Motor Speedway was constructed in part to help advance the automotive industry, which at that time was the new technology of the day. 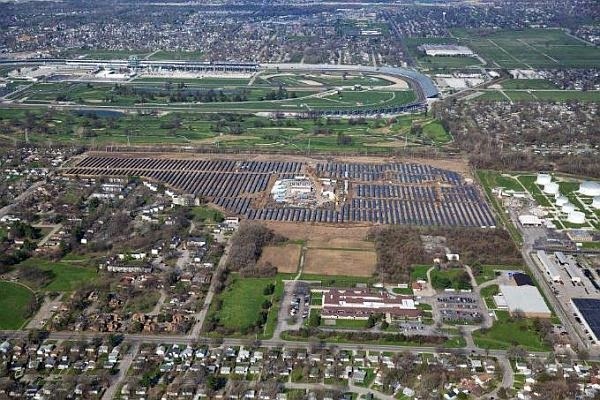 Today, the unused land at the IMS property just east of the race track has been transformed into a solar energy production facility that will provide an alternative source of energy to IPL customers.” - J. Douglas Boles, Indianapolis Motor Speedway president. TheGreenMechanics: That's Cool! Thumbs up. What the folks at Indiana Motor Speedway did was utilise the dormant space near the backstretch of the racetrack and turn it into energy farm. I guess, for the guys running the sporting facility, it's a straight forward kind of idea and one that is sensible, doable; it's just a matter of what to decide and when.